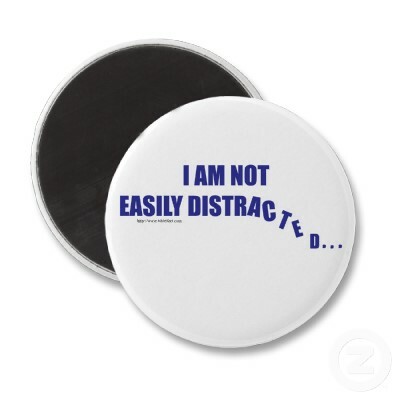 Do you get distracted easily? Are you about to leave this page and move on to the next? AM I BORING YOU TO DEATH? Oh, wait, I did it again, sorry. You see, this is what I have been trying to talk to you. I have a problem. I get distracted. Easily. Way to easily. My attentions span is getting shorter and shorter the older I get. When I am on deadline. Forget about it. Unless I can find a sensory deprivation chamber, it is a good bet that I will always be this way. A thought, a sound, a song, a feeling, a movie, a bug, a wrinkle on my shirt; any and all things can get me distract. Distracted is defined in Webster as mental confusion. Mental confusion. Well, that is confusing and distracting. I mean. Of course is it mental confusion. Is there another kind of confusion? You can be sexually confused, but that is not distracting. You can be physically confused, but if that is the case, you have more problems to worry about them distractions. There I go again, the post is not about confusion, it is about distraction. Wait, what was I talking about? If something or someone is distracting me, they are taking my attention away from something that is important. And, I get it. I am allowing that to happen. But, what I need help with is how to stop it. Stop the distractions. Stop letting other things distract me from my goal. The reason I bring this up today, beside the fact that distraction starts with the letter D (shout out to #atozchallenge) is I am thinking about this trip. Yeah, the Australian adventure (I know you were wondering when I was going to get back to that). This is the first real vacation I have had in a long time: my dream vacation. I fear that I will allow reality to get in the way and distract me from fully enjoying it. It has happened before. I let an email or text message, a relationship or even the state of the world prevent me from fully engaging in the present and enjoying my vacation, sans distractions. I still have 11 days left to try and circumvent the distractions. Short of destroying my computer and cell phone before I go, perhaps I can do some preparation and just let go and only be distracted by the wonders of Australia. Huh? Sorry, I wasn’t paying attention. No worries. I already forgot what I wrote about. HAHA. My mind is already in Australia. I’m distracted right now. I’m supposed to be at work. I am most distracted at work. I secret wish that I will get fired, then I can do this writing/blogging/tweeting thing all day. HAHA Thanks Diantha.